WASHINGTON ― A pair of GOP senators tried to secure a vote this week on an amendment aimed at restraining President Donald Trump’s ability to levy tariffs ― a move that could have been an embarrassing rebuke of the president’s trade policies. But they were thwarted on the Senate floor by an unlikely voice: a progressive Democrat. Sens. Bob Corker (R-Tenn.) and Pat Toomey (R-Pa.) asked for unanimous consent on Wednesday to amend must-pass spending legislation known as the farm bill with a measure aimed at restraining Trump’s authority to unilaterally impose tariffs on national security grounds. They argued that Trump’s tariffs on steel and aluminum from allies like Canada and European Union member nations opened a growing trade war that is hurting American businesses and costing jobs. “This is bad for our economy. It’s bad for my constituents,” Toomey said on the floor. The relatively modest measure would have clawed back some power from the executive branch that Congress delegated away decades ago and set up perhaps the most direct challenge to Trump that Republicans have dared to mount during his presidency. 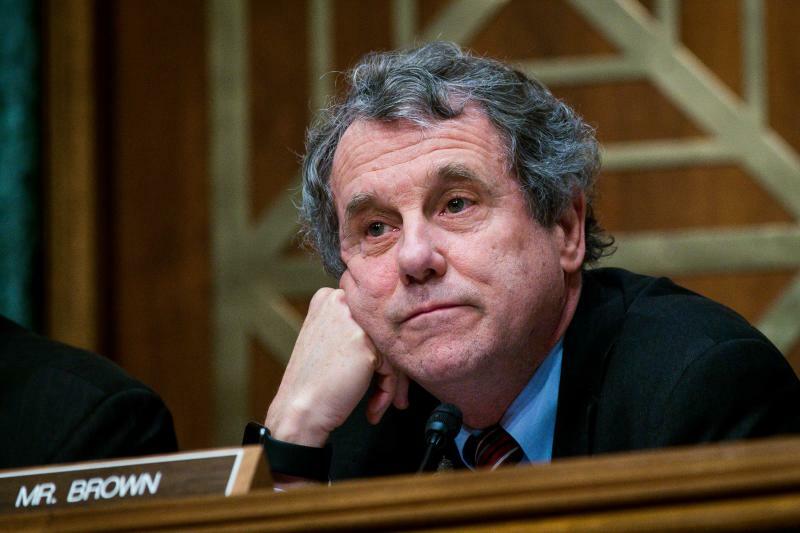 Sen. Sherrod Brown (D-Ohio) objected, however, stymying the effort to tie Trump’s hands on trade ― at least for now. Brown, a progressive who is up for re-election this fall in a major steel-producing state, is certainly no Trump ally. But Brown has consistently supported Trump’s tough stance on China and has echoed the president’s criticisms of the North American Free Trade Agreement and other trade deals. It’s playing well at home, wherehe’s polling comfortably ahead of his GOP challenger. “We should not pit farmers against steelworkers,” Brown said Wednesday, before objecting to Corker and Toomey’s request to amend the farm bill with a measure focusing on tariffs. Brown argued that the Corker and Toomey amendment would harm Trump’s “ability to protect America’s national security interests” by limiting his authority to unilaterally impose tariffs on countries like China, which has been accused of stealing U.S. companies’ intellectual property. “Why would any colleagues vote to let China off the hook?” Brown asked on the floor. But senators who support challenging Trump on trade say he has abused that authority by citing national security as a rationale to target U.S. allies. Corker insisted that a vote on tariffs was proper to hold this week as the Senate considers the farm bill because farmers in states like Iowa and Minnesota are being badly hit by retaliatory Chinese tariffs on products like soybeans. Trump’s escalating trade war is having negative consequences for U.S. businesses as well. Harley-Davidson, Trump’s favorite motorcycle company, for example, isbeing forced to move some production overseas to avoid damaging tariffs. Republican leaders have thus far been reluctant to challenge Trump over his trade policies, however, fearing that an intraparty clash could hurt their chances in the November midterm elections. “I think the president’s pragmatic, and I think he will, at some point here, figure out whether this is working or not working and do the right thing for the country,” Senate Majority Leader Mitch McConnell of Kentucky told reporters on Wednesday. House Speaker Paul Ryan of Wisconsin, which is home to Harley-Davidson, criticized Trump’s tariffs as “basically taxes” earlier this week. But he has not pushed for legislation to undo them either. The effort to restrain Trump on trade may have suffered a setback this week, but the fight isn’t over.Senate finance committee chairman Orrin Hatch (R-Utah) said he plans to move separate legislation in his committee to address Trump’s tariffs. Sen. Jeff Flake (R-Ariz.) told HuffPost on Wednesday that those who oppose Trump’s tariffs may try pushing for a vote on the issue again this year with another must-pass spending bill to reauthorize the Federal Aviation Administration.